Scotch Whisky giant Chivas Regal this month launched “The Venture,” a competition in which applicants from 23 countries — including Costa Rica — will have a chance to pitch a proposal for a share of a $1 million fund as well as counseling and mentorship to accelerate the winning projects. The Venture is open for businesses and startups as long as they offer a positive impact on their countries. It was first held in 2014 with finalists from 16 countries, and for this year’s edition Costa Rica was included among the eligible nations. In addition to the funds and counseling, finalists will have global exposure and the opportunity to raise additional funds through the crowdfunding platform Indiegogo. The Venture is open to social entrepreneurs who have an established, for profit startup or business. Businesses in early stages are accepted as long as they have a working prototype of their concept, ideally with some demonstrable user traction, and generating a maximum of $500,000. Young entrepreneurs are allowed but at least one of them has to be over 25. Businesses in a growth stage also can participate as long as they can show significant user traction and sales, generating a maximum of $1 million. The main requirement for all is to demonstrate that their business has a positive impact for their country. Businesses or projects can be technological, environmental, community-based, public health-oriented or from other areas that can result in benefits for the social environment. The local call is open for Ticos and foreigners legally residing in Costa Rica and whose projects will be developed here. Interested entrepreneurs can submit their proposals through an online form at www.theventure.com before 9 p.m. (Costa Rica time) on Oct. 31. The best five proposals from Costa Rica will be disclosed on Nov. 14 and those selected will have to pitch them before a jury for a maximum of 90 minutes. The winning proposal will be announced on Nov. 26 and the entrepreneurs will travel to the Dominican Republic to pitch their proposals before an international jury along with winners from that country, Guatemala and Panama. Each regional winner of The Venture will travel to Silicon Valley, California, for a week where they will have the opportunity to participate in trainings and seminars at companies such as Indiegogo, Google and Singularity University, among others. Finalist proposals will be submitted to a public vote during five weeks where they will compete for five weekly prizes of $50,000. Chivas brand manager in Costa Rica Dennis González said the remaining $750,000 will be distributed in June 2016 among the three best projects worldwide in a final pitch (in English) also in California. The contest this year will include representatives of 23 countries, among them Japan, Indonesia, Korea, Chile, Mexico, Spain, England, South Africa, United States, Panama and Guatemala. 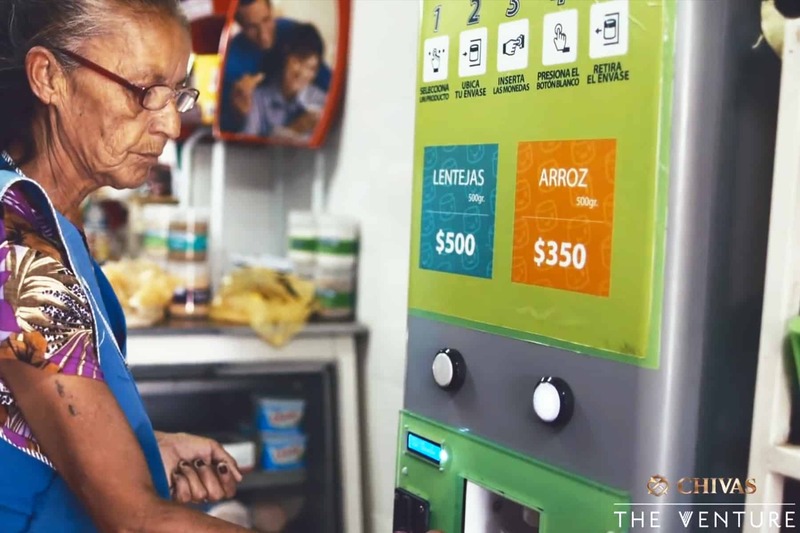 One of the winners last year was a project from Chile involving the manufacture of vending machines dispensing basic grains (rice, beans, lentils) in small amounts aimed at poor people who cannot afford to buy a kilo. Chivas also granted funds to a Brazilian online platform to file complaints against public agencies and also to a project in Japan for manufacturing a device that measures the humidity of plants to determine the exact amount of water needed by crops. “During the fundraising stage alone, 14 of the 16 finalists raised more than 100 percent of the funds they required to develop their initiatives,” González said.